Infrastructural applications and services provide support and administrative functions for semantic web applications and the development of ontologies. 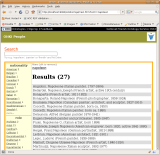 Simple SKOS-based version of ONKI on top of a SPARQL endpoint. An ontology server for publishing SKOS and other vocabularies. Semantic mash-up-widgets for injecting content and functionality from semantic portals to any web page.